The beautiful resort town of Lozenets is located roughly 60 km from the airport at Burgas, and offers visitors a great way to escape – with picturesque golden beaches, a friendly small town atmosphere and the rolling, green hills of Bulgaria at your back. 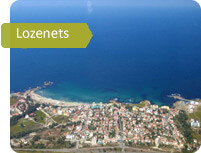 Planning a trip to Lozenets this summer? Well, be sure to talk to AroundBulgaria before you go! We’ve got some great deals available on transport and taxi services in Lozenets, and the rest of Bulgaria too – we’ll be only too happy to chat to you about your plans, and help you to get the very best out of your visit to Bulgaria. Why Book our Lozenets Taxi Service? Just tell us where you want to go, and we’ll get you there – our taxi service is available throughout Bulgaria. Regardless of what you’ve got planned, we can offer you a taxi service that perfectly meets your needs. No matter whether you need a taxi by night or day, we’re always on hand to deliver transport – with a handy 24-hour booking system. We can cater to almost any occasion, thanks to our wide selection of vehicles – include cars, SUVs, minibuses and minivans. All of our services come with complimentary insurance, covering all vehicles and passengers. We’re ready to accommodate your sporting gear, with the provision of spacious, secure roof racks. Children’s seats are also available on request! We’ve equipped our vehicles with full wireless Internet access, allowing you to surf the web as you travel. During the journey you’ll have complete control over your surroundings – so feel free to set up the music player and the interior temperature as you want them! For your comfort, all of our vehicles are kept smoke-free and beautifully clean throughout. Book your Taxi Service in Lozenets Now! Call us today and our advisors will be able to offer you a competitive quote on a taxi in Lozenets… charging either by time, or by distance, depending on the arrangement that suits you best. Once we’ve found the right deal for you, prices are fixed in place… which means no hidden charges, and no extra fees later on. We never ask customers for advance payments. In fact, you’ll have nothing to pay until you arrive at your destination – where you can simply pay your driver in person. In addition to local Bulgarian Levs, our drivers will also be happy to take payments in US Dollars, Russian Rubles or in Euros. When you call, don’t forget to ask your advisor about our range of special offers! There are some great discounts available to customers who arrange multiple trips with us in one booking. So get in touch with AroundBulgaria today – and unlock some fantastic discount deals on professional taxi services in Lozenets and beyond! Despite the fact that Lozenets is a small resort, it abounds in opportunities for entertainment. No one will be bored there, and adults, children, and teenagers alike will find the entertainments to their taste. On the beaches you can find numerous trampolines, inflatable castles, water slides. There are also opportunities for journeys on yachts, during which the picture perfect landscape of the land unfolds seen from the sea. Fans of more action packed vacations can engage in surfing, diving, or cycling. In the evenings, discos and night clubs invite with their ambience. In addition to plenty of sunbathing and bathing in the sea, it is a must to visit the local sanctuaries and parks where, in addition to unique plants, rare animal species can also be observed. A vacation in Lozenets will certainly leave lasting memories! Unlike our service – the driver might not speak English, will not meet you at the arrivals, will accept cash only.